Thirty one times, the genealogical community has honored one of our best, one that we’ve lost. Thirty one times, the focus has been on someone who has made contributions to the field of genealogy that were of lasting significance in ways that were unique, pioneering, or exemplary. Thirty one times, individual genealogists and groups have nominated those persons whose achievements or contributions have made an impact on the field — and one has been selected: a genealogist whose unique, pioneering, or exemplary work lives on today. 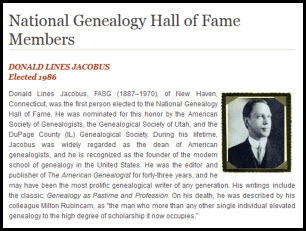 Starting in 1986 with Donald Lines Jacobus and continuing to 2016 with Marsha Hoffman Rising, 23 men and eight women have been elected to the National Genealogy Hall of Fame. Through her writing and teaching, Marsha Hoffman Rising enlightened thousands of genealogists. Her publications demonstrated both sound and innovative methods for difficult research problems. Marsha was consistently rated among the best of teachers and her lectures at the major genealogical events helped mold the conference structure into a major educational forum. Her leadership enhanced and guided the genealogical institutions for which she served. She was and continues to be a role model for all facets of genealogy today. Marsha Rising became a Certified Genealogist in 1986, and a Certified Genealogical Lecturer in 1989, then served on the Board for Certification of Genealogists as a trustee 1995-1997. The American Society of Genealogists elected her as a Fellow in 1992, where during the years 1998-2007, she served as president, vice president and secretary. The Utah Genealogical Society elected her as a Fellow in 1990. She was one of the founders of the Genealogical Speakers Guild in 1992, and the first elected president. Thirty one of our best… And it’s up to us to help select the 32nd person. The National Genealogical Society and the National Genealogy Hall of Fame Committee are seeking nominations from the entire genealogical community for persons whose achievements or contributions have made an impact on the field. The next honoree and the society that honored the nominee will be announced at the NGS 2017 Family History Conference in Raleigh in May. Nominations for election to the National Genealogy Hall of Fame are made by genealogical societies and historical societies throughout the United States, and have to be submitted by 31 January 2017. Here’s a link to the official nomination form so no excuses! Let’s all put on our thinking caps and consider those who were among our best… those we can honor for their service to our community. It only takes a few minutes to help honor and remember a lifetime of service.